#3-05 Unusual and rare antique pool table constructed of plank mahogany. Manufactured in the 1880s, this table features extensive use of Brunswick's signature "dental work" carvings on the cabinet sides, along with multiple rows of carved beads. 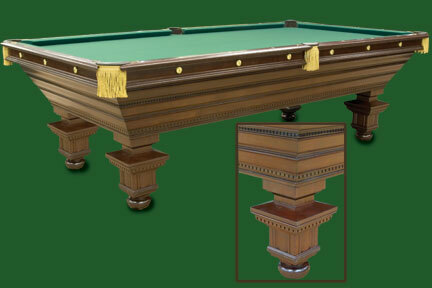 The design continues on each of the four legs and the result is a pool table of elegant appearance to compliment any decor. Diamond sights of genuine ivory. Nine-foot size with Vermont slate playing surface. Dark cherry finish. Completely restored, ready for immediate delivery.